The results from a set of international studies may now revolutionise fishing regulations. Many popular measures to combat overfishing help conserve mostly small juvenile fish. The results from a set of international studies may now revolutionise fishing regulations. Before it lands on our plate, any wild fish should spawn at least once. This is a basic principle in fishery management. Accordingly, professional fishers and recreational anglers have to release any fish they catch that is smaller than the minimum size stipulated in many fisheries regulations; only the big ones they are allowed to retain. However, this policy does not take into account the extraordinary ecological importance of large spawners, as was pointed out in several recent studies led by Dr Robert Arlinghaus, Professor for Integrative Fisheries Management, of the Leibniz-Institute of Freshwater Ecology and Inland Fisheries (IGB) and the Humboldt-University of Berlin. The unintended consequences are lower harvest in terms of number of fish and smaller fish within the stock. Scientists from the Australia, Germany and the United States now propose that it might be better to implement harvest slots as an alternative to the popular minimum size regulation in recreational fisheries. These ‘harvest windows’ would protect both the young offspring and the experienced heavyweights, and at the same time conserve the big fish that are rather popular with hobby anglers. “I’m glad that I’m not fat (…) I’m glad that I’m such a thin herring, because to be thin means to be free“. These controversial lyrics from a song by the German singer Marius Müller-Westernhagen describe – albeit unintentionally – the dilemma of many existing fishing regulations. Because up to this point, many measures taken against overfishing aim at protecting the small fish, the ones that reach sexual maturity for the first time. Initially, the underlying idea sounds plausible: juveniles are to be conserved until they are big enough to proliferate at least once. After the reproduction process is completed, they can easily fall victim to a fishhook or end up in a fishing-net. But this only works as long as the existing fish stock keeps producing enough offspring. One thing holds true for many fish species: When the quantity of parental fish is low due to overfishing or environmental impacts on habitats, a greater quantity of eggs usually leads to a higher number of juvenile fish. In this regard, the productive large female fish play a fundamental role in repopulation. If the mega spawners are systematically taken out, this favours more inexperienced, smaller females whose reproductive output is lower. But there are also reasons in our economy and our society that speak in favour of protecting the “Big Old Fat Females”. “Anglers love photos with big fish in remembrance of the special catch, and professional fishers get higher market prices for some fish species, such as cod, if the fish is bigger,” says fisheries scientist Arlinghaus. 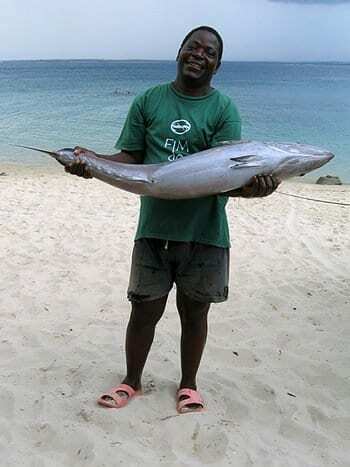 Unfortunately, big fish are extremely rare in harvested fish stocks. Even fin-wearing underwater residents prefer large lovers in their world. That is hardly surprising. Several recent studies, including work in the laboratory of Prof. Arlinghaus, have shown that larger fish not only produce disproportionately more eggs, but also larger eggs, which in turn results in offspring that is more resistant. In contrast to many mammals and to us humans, fish grow all their life and invest in reproduction well into old age. “From an ecological point of view it is better if a fish population consists of different size and age classes. This diversity in age pays off. Oftentimes, fish of various sizes and ages reproduce at different times,” explains Arlinghaus. “If events in the environment destroy the eggs of a specific timeframe, the population can still guarantee the offspring and thus contribute to more stable stocks.” Also, the big and the small onesmay take with you any fish that fits within the slot,” explains Arlinghaus. Anything smaller or bigger than the harvest window must be returned to the water and is allowed to stay alive. “We have shown in computer simulations that the use of the harvest slots m, the old and the young ones, they all have different places to stay, different routes to migrate, and different nutritional plans. If you strongly exploit the population by catching and removing a vast amount of fish, consequently creating a fish stock that mainly consists of juvenile and first maturing fish, this will negatively affect not only the reproductive performance of the stock, but also the entire food web and ecosystem. March 19, 2019 - Overfishing, coral reef degradation threaten rare parrotfish species in Andaman FirstpostProtected areas like coral & algal cover significantly affect the distribution & abundance of these fish.